As the winter solstice approaches, I find myself taking stock of the past year and looking forward to projects and enterprises in the next. A genuinely disappointing episode with a would-be apprentice who took on a job way beyond his abilities, then refused to pay me for doing most of the work, is slowly grinding it’s way through the courts. That knocked a big hole in my summer, in the middle of which I lost my brother-in-law after a long, painful struggle with liver cancer. In September, we lost our dear friend Matt Ross, and I’m really pissed off about that. This door has opened an entire realm of possibilities. 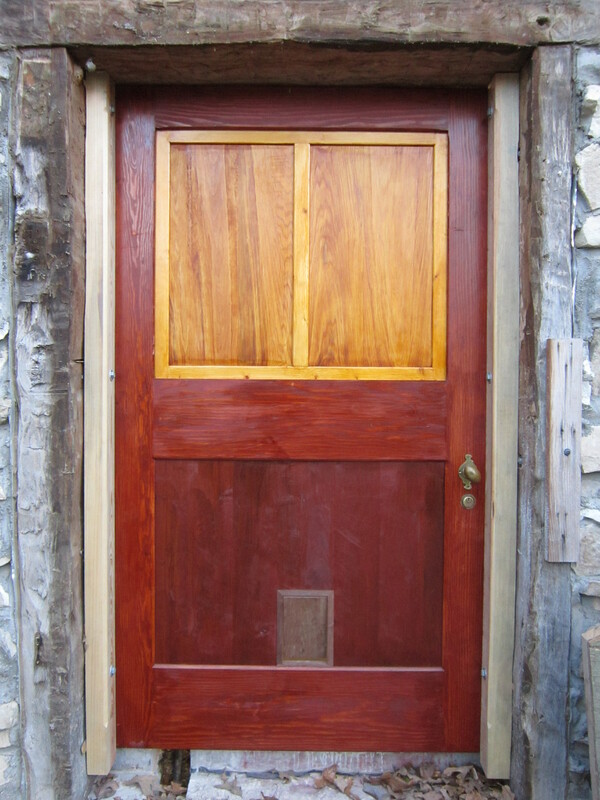 Matt built this room from rough limestone gathered off the farm, hewed beams from red oaks that he felled himself, and never got around to finishing this opening (a bum knee, chronic pain; an obsession with hand-forged, laminated steel blades). I was supposed to be helping him hang a different door there when he died. Turned out, Sheila didn’t really want that door after all, so I built this one to suit. The frame is 2″ thick Douglas fir, set into 4 x6 pine jambs. Blackberry the cat is happy with the cat door, and on sunny days the upper panel hinges inward as a sort-of Dutch door. All this involved re-routing water and propane lines through that cut in the concrete, and removing part of the 6 x 8 oak sill and concrete foundation inside to make room for a 4-panel farmhouse door. The house is well on its way to being handicapped accessible, should that ever be necessary. Now, on to the Japanese tools. “While Japan has been, since the eighth century, a land dotted with Buddhist temples, wooden structures that are usually rebuilt as before when they are destroyed by fire, the most extraordinary notion and practice of historic preservation are applied to the Shinto shrines in the forest of Ise. These are exceedingly simple, seventh-century buildings made of soft-textured cypress beams, standing on raised platforms and having crossed end-rafters and thatched roofs. They appear modeled after storehouses for rice from earlier times. Each one is set on a rectangle of carefully laid out stones. Next to one side of this rectangle is another, identical rectangle of stones. Every twenty years a team of carpenters arrives, and on each empty rectangle, they construct an exact replica of the building in the adjoining space. 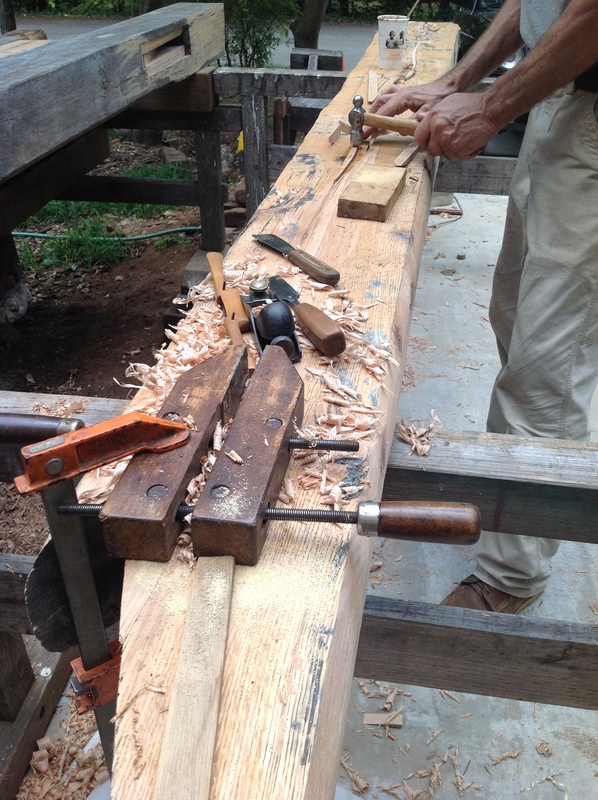 Using only hand tools, they cut the cypress beams with immaculate precision and leave the finished work unpainted. Ise by Kenzo Tange, Yoshio Watanabe, and Noburo Kawazoe (1965, Zokeisha Publications Ltd.) is a stunning photographic documentation of the 1953 rebuilding of the temples at Ise. What is not immediately apparent; that there are two temple precincts, several miles apart, and thus two separate and complete building processes going on, becomes clear through the maps, text and photos. The appendix shows two similar Shinto temples that have not been subjected to this generational cycle of rebuilding, but have instead been carefully maintained, one from 1744, the other from 1346. One of the primary applications of scribing gouges is in making timber shoulders fit waney edges. This is a straining beam that engages a brace on either end, but the joinery is still a brace mortice, layout at 45º to the axis of timber. Matt Ross made this chisel some years ago, inspired by a French example. I can’t say for certain that the cranked handle and flared corners were made just for this purpose, but it damn sure does the job. This gouge, all told, has cost me something in the neighborhood of $6k so far, but that’s another story for another time, as is the owner’s mark. The maker’s mark, at the top of the photo, appears to be RUST, which I believe to be an early 19c English maker. The owner’s mark, J L CRIST, was stamped twice. I imagine him to have been a distant relative of the JESUS H CHRIST whose name I have heard invoked so often in shops and on building sites. Believe what you will… There are a lot of gaps in the historical record; I believe that most people just want a good story. The result, as always, speaks for itself. Final assembly, pulled tight with come-alongs and straps, measured and diagonals checked, ready to mark draw-bores. You probably can’t see it, but there’s a string with gage blocks stretched across the shoulders. This was the trickiest setup I have ever worked with, one click on any ratchet affected everything else. Precise measurements, btw, are facilitated by driving 3d galvanized box nails at measured points on the layout lines. 3-4-5 for post to beam fit-up; check parallel then pull diagonals on bents. 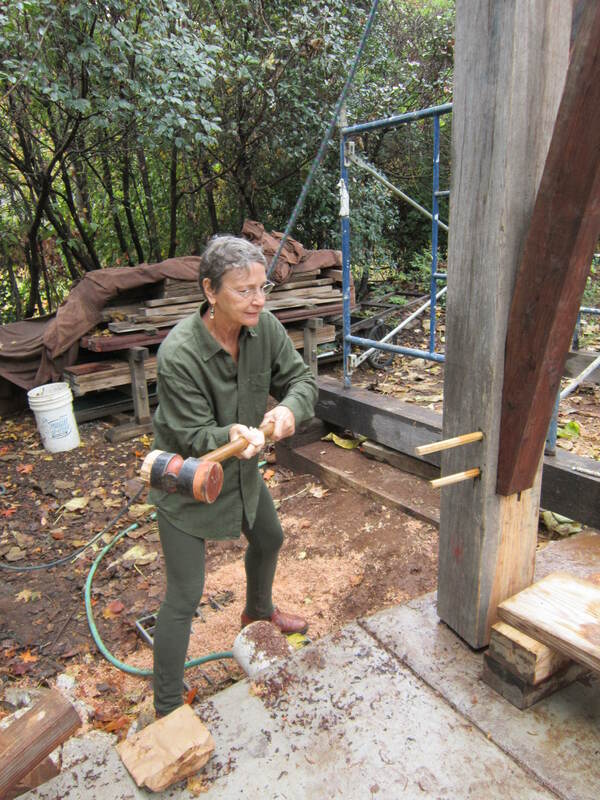 Recently I was sent a link to a paper titled The Invisible Tools of the Timber Framer Well worth reading, but still doesn’t quite reach the bottom of the toolkit. There are a few tricks in fitting tight shoulders in timber, some of them useful for smaller-scale work as well. Fitting up irregular stock into mortice and tenon is a challenge, getting a snug fit at the shoulder being the final test. Dividers help, down to an interval of ⅛” or so, but even the sharpest point jumps and scratches along. For a quick reference, use a “half-pencil scribe”. Lay the pencil flat on the receiving timber and draw the point across the meeting surface. Work parallel to that line. One of my essential tools is an old 12″ combination square blade with it’s own hand-sewn leather sheath for protection. I use it as a feeler gage in fitting shoulders, along with a collection of 6″ blades of different thickness. I also use a Starrett tapered gage, about 3″ long, and several maple and boxwood wedges that make up my gap gages. Wooden wedges are especially useful when working the underside of a timber assembly; a quick pencil mark across, measure the resulting thickness, map the result. A sharp mill knife (or something equally robust), a steel straight edge, a carpenter’s pencil shaved to a chisel edge (for lighter work, a regular #2 shaved flat with a block plane and pared down), a #705 ink pencil followed by a spritz of water will leave an indelible green line. Chalk has it’s place in fitting up, but one must be careful of the mess it leaves behind. David Pye used the term “offer up and fit” which is particularly the case in fitting a shoulder to an irregular surface. As the shoulder approaches an ideal fit, I leave a margin of ¼” that will actually contact the surface, then slide a piece of coarse sandpaper through the joint. The resulting scratches show a marked contrast to chisel or gouge, and paring away those marks will result in a tighter and tighter fit. This is where those scribing gouges really shine. The machine works, insofar as my workbench and hand tools can be considered as such. In four days, I produced four carcases. That along with visitors, housekeeping (such as it is) and trying not to make noise when the rest of the family is asleep. I want to explain this effort: My dear friend Matt Ross (artist, blacksmith, boatbuilder, woodworker) died early September at the age of 68, the diagnosis: idiopathic pulmonary fibrosis. He checked into ER in mid-August with symptoms of asthma and bronchitis, progressed to ICU, and was finally sent to hospice with a couple of days to live. For once the doctors got it right. I had about five minutes with him in hospital while he was still conscious and lucid, and he asked me to take care of his collection of Japanese tools. These boxes are intended to house that collection, at least while I photograph and document and figure out what should be done with them. The two maple boxes 5 x 11 x 22 are for chisels and hammers, the large poplar box 7 x 16 x 45 is for saws, and the mahogany box will hopefully hold all the planes. There are at least twenty planes in presentation boxes, everything else is in racks on the wall. I’m going there this afternoon to begin. Moving on, I have had this dream for years of a craft school here in Arkansas. The people who should be doing this, Department of Heritage, are miserably incompetent and have assured me repeatedly that they (having tried once and failed) will never attempt such again. That, and the fact that I took them to court several years ago (and won) leaves me pretty much a pariah. Meanwhile, I have a respectable collection of woodworking tools, ranging from carving gouges to boring machines, all in excellent condition. By that, I don’t mean collector’s “excellent”. I mean that my tools are SHARP. In fact, that’s the condition by which I inherit Matt’s tools. In his estimation, I’m the only person he knew who could be trusted to know how to sharpen. This is flattering, but doesn’t move us toward actually putting these tools to work. This is not a “Bad Axe” saw. It’s an old Disston that I restored and sharpened myself. I refuse to pay $250+ to anyone for a backsaw (especially one who touts Ann [sp.] Rand’s odious philosophy). Likewise, Lie-Nielsen. I have a “special” $40 dovetail marking knife waiting to send back because the point rolled over the first time I used it. Lee Ferguson, just down the road from me, makes a much better knife for $20 that holds an edge and doesn’t roll off the bench. The chisels I use are a duke’s mixture of brands that no longer exist (at least in this quality), Addis, Buck Brothers, Eskilstuna, Keen Kutter. 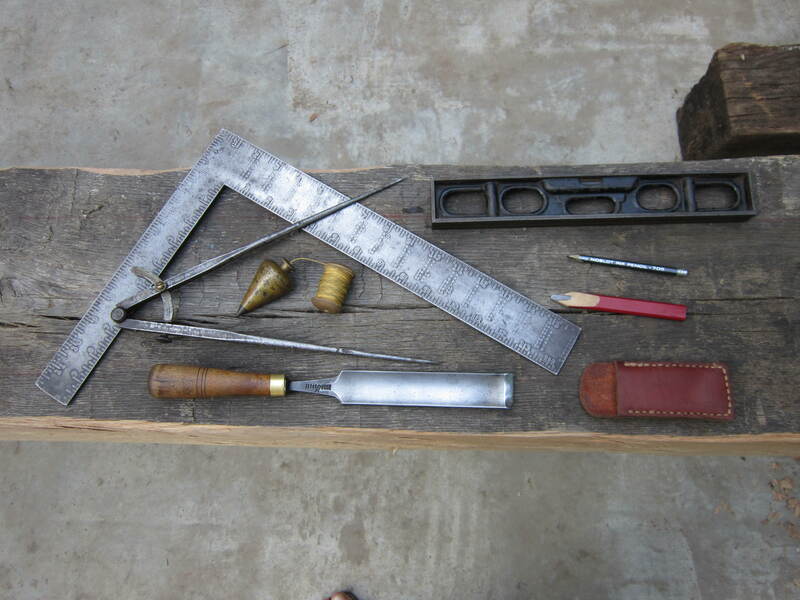 and to keep tools in use, not archived in a museum. In the current issue of Wooden Boat, John Summers reviews Japanese Wooden Boatbuilding by Douglas Brooks. Looking ahead, several rainy days were forecast for this weekend, so I planned to spend the time at my workbench building some toolboxes. From pallets salvaged behind the furniture store down the street, I have a small lot of poplar planks, some pseudo-mahogany, and a soft white wood that might be maple. Enough for four boxes. 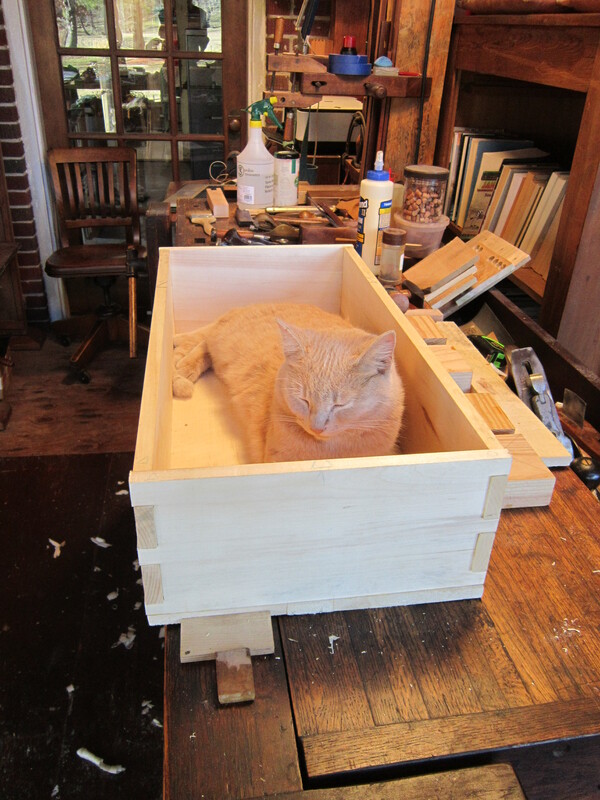 I need storage for Matt’s collection of Japanese hand tools, so that’s the basic idea, Japanese style boxes, except that I wanted to cut dovetails, not drive nails. This setup is sort of like a Moxon vise, in that there’s two screws and a couple of pieces of wood, and it hold a board so that I can chop dovetails. Works fine, cost nothing. The tail vise holds stock for marking and sawing. So far I have three boxes fitted up, will get on the mahogany pieces tomorrow. The cabinetmaker’s triangle is pretty much standard stuff, but not quite enough to keep reference when cutting dovetails. The marks near the ends do that // X ^ O so I can easily locate position. Because this wood is salvaged, I have spent quite a bit of time jointing and gluing up, using a couple of Matt’s Japanese planes. For surfacing, I’ve been using a couple of Stanley 5 ¼’s. Do two 5 ¼’s equal a 10 ½? NO. I am in the middle of dealing with a major windfall of tools right now and it’s given me a lot to think about. For starters, I’m pretty competent with the tools that I have and still learning from them. Now, I am in a position to pursue working with a choice lot of Japanese tools. What sort of changes will that bring? 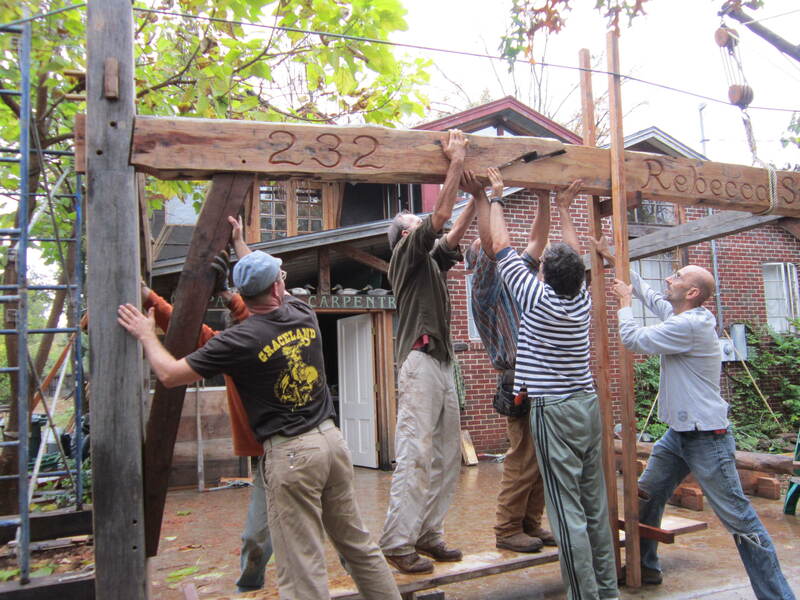 The rain finally stopped mid-afternoon, and we were able to raise the frame. Not a bad way to spend a Saturday afternoon. A few friends who will always show up on short notice, a chance to involve the neighbors. Block and tackle for the heavy lifting, then marrying up the scarf for the last time. For the past couple of months, whenever I could find the time, I have been fitting up a frame out of some seriously twisted oak timbers. I’ve learned a few things, using some tricks and tools that have been acquired along the way. Some of this is terrain that most woodworkers never have and never will explore, and I have made some attempt to share the experience. When I started learning timber framing back in the 80’s, the book to have was Tedd Benson’s. Fortunately, I didn’t get the memo on that; instead a friend had given me a copy of Cecil Hewett’s English Historic Carpentry. Hewitt didn’t discuss tools or layout (go-to for roof design and drawing style); as I learned later, Benson didn’t really explain layout. Neither did anyone else, at least not very well, or with any sense of authenticity. Jack Sobon hints a bit at square rule in his second book, and there’s an early Fine Woodworking article by Ed Levin that explains a bit of layout. The old books on the framing square refer obliquely to this mysterious process called “boxing the joints”, about as useful as the Essex Board Measure table. In The Timber Framing Book, Stewart Elliott completely missed the point on brace layout, it’s so obvious that he hadn’t looked hard at a framing square or a barn. Further back, in the 1920’s, Audel’s was seriously misinformed about braces. Recently, I took a long look back through Roy Underhill’s Woodwright’s Shop series, thinking that I might have missed something. Nope. This is one place where the luminaries will leave you in the dark. They’ll tell you how to cut, what tools to buy, lots of he-man raising pics, but very very little about layout and design. The thing is, laying out is pretty fundamental. The lines have to be in the right places, and then you need to know how to cut to the line. If you expect to make a living, the process has to be accurate and efficient. Most people, coming from carpentry and cabinetmaking, assume that the timbers need to be straight and square to begin with. I know I did, and there’s certainly nothing amiss with that approach. You will get results, your buildings will just look rigidly mechanical and sterile, because there’s nothing inherently organic about straight lines. Nature designs with curves. Laying out bowed, twisted, crooked, waney timbers requires a different approach. Until a couple hundred years ago, any good European carpenter would have been able to lay out joinery, cut and fit, in just about any sort of timber imaginable. He would have been equipped to square timbers with an axe, and plane their surfaces with a broadax and slick. Layout would have begun with a plan and section drawn out on the ground, timbers cribbed up on blocking, joinery marked out with a plumb line and scratch awl. In the American experience, timber was long, straight, virgin…and a new model evolved. We call it Square Rule, and it’s evident in most barns and houses from about the second quarter of the nineteenth century until maybe the end of the century, depending on where you are. Audel’s certainly didn’t understand it, or at least they failed to explain the concept. Neither did any of the mid-20th c. writers mentioned earlier. Meanwhile, the evidence of Square Rule lay like a blueprint, echoing the Plumb Line in buildings of an earlier epoch. I have combined square rule layout with plumb line layout in this frame; because it suits me, and planing all that timber square would have been a ridiculous waste of time and wood. The initial bents were cut in a workshop, and with some adjustment they still fit. For the main beam and braces, I wanted a more traditional look, and a chance to use some tools that haven’t seen use for a while. Diminished housings are easier to cut and fit than parallel housings, particularly in twisted timber. There is no one best way; there is only geometry, sharp tools, good joinery design, and respect for the trees. The trees, btw, are all second growth, now. Which is a polite way of saying that we’ve cut all the good straight virgin timber and all that’s left is crooked, twisty stuff that is a real challenge to work with. Much like what the European carpenters had to work with after centuries of building, war, shipbuilding, war, more war, and general waste and abuse.